Want Free Access to Dolly Parton Pics & Clips? Dolly Parton is known for three things: great country music and her impossibly enormous mammaric mountains. Born in rural Tennessee, one of twelve children living with both of her parents in a one-room cabin, by the age of twelve Dolly was performing her musical act on Knoxville TV stations, and by thirteen she played the Grand Ole Opry. That's pretty impressive for a little girl from way back in the hills with a pair of gorgeous flesh hills. In 1967 Dolly finally hit the big time with a secure spot on the hit variety series The Porter Wagoner Show. When that gig dried up, she started her own variety series, Dolly, in 1976. Acting being the next logical step, Dolly won a part in the hit office flick Nine to Five (1980). The movie got her an Oscar nod for Best Song, but, sadly, she didn't win it. As if it matters. Dolly's mantle sports more Grammys than you could shake a stick at . . . plus she's got a fine pair of trophies that she carries around with her daily. 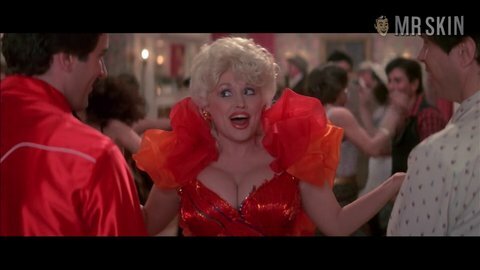 Since then, she's appeared in such memorable pictures as The Best Little Whorehouse in Texas (1982), Rhinestone (1984), and Steel Magnolias (1989), which made Dolly's dumplings a matinee idol. Unfortunately, in spite of her infamous top-heavy five-foot frame, Dolly has never shown any skinage onscreen outside of some massive cleavage, which is truthfully more than most actresses can offer even with their shirts off. Hello, Dolly!